Make the dressing by whisking together all of the ingredients in a small bowl. Prepare the kale by slicing out the stems and chopping out the leaves into small, bite-sized pieces. Transfer the kale to a big salad bowl. Sprinkle a small pinch of sea salt over the kale and massage the leaves with your hands by lightly scrunching big handfuls at a time, until the leaves are darker in color and fragrant. Drizzle salad dressing over the kale (you might not need all of the dressing) and toss well so the kale is lightly coated with dressing. 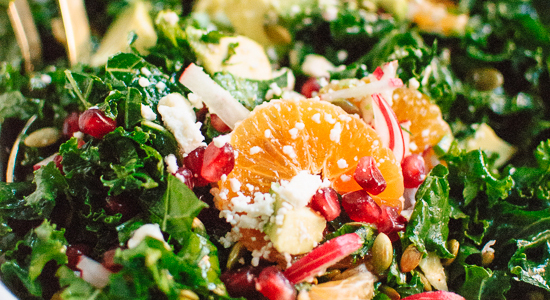 Add the prepared avocado, pomegranate, mandarines, radishes, coriander and feta to the bowl. Toast the pumpkin seeds in a pan over medium-low heat for a few minutes, stirring frequently, until they smell fragrant and toasty. Transfer seeds to the salad bowl. Toss the salad to combine and serve.